She Bu De (Seh-Boo-Deh) – Writer. Editor. Storyteller. 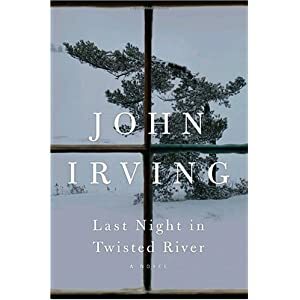 For a while now, I’ve been mulling over my unconditional love of John Irving. I’ve been plugging away at Last Night in Twisted River for almost two months. I picked it up before a Labor Day trip to New Hampshire. The Granite State’s most famous–at least in my world–son’s newest novel seemed like the obvious choice. But long before that a Colin McEnroe Show episode about “The Era of Bad Books” and a NPR essay called Proud and Unpretentious: Lessons from John Irving got me thinking. “According to my literary colleagues good fiction needed to be dense; like Faulkner dense,” Joshua Braff said in his NPR essay. (He also says, “You can’t poo-poo Garp.”) Over in the era of bad books, folks were more concerned with Dan Brown and Twilight than with Garp, but it was clear that Irving’s books weren’t quite up to the panel’s literary standards. In recent years, I’ve found it slightly harder to defend Irving. His books have become, well, sprawling. The thing, though, about his novels–even the ones I don’t count among my favorites–are that they keep me engaged. I turn the page. (On the other hand, I have been reading One Hundred Years of Solutitude for no less than 10 years…and still have not managed to finish it–and never will.) And more often than not, I don’t want the books to end–no matter how sprawling–because I just don’t want to go to bed at night without checking in with Owen Meany (or T.S. Garp or Homer Wells). I found that I was crying, and hadn’t even really noticed. I had finally gotten to what the entire book had been building up to. (Shortly thereafter the main character heads to the New Hampshire hotel where I learned to ski.) And now, as the book is winding down, I am starting to feel just the way I always expect to at the end of one of Irving’s books. As the characters in Twisted River say, “She bu de.” I can’t bear to let go. This is what I look for in a favorite book: The feeling that I don’t want the story to end, or the characters to leave me. I am not necessarily looking to plumb the deepest, darkest depths of my soul. I don’t need my favorite writers to stretch the language to its very breaking point just to create something new and different. I want a good story and characters that I care about (like little Oskar Schell). I would argue that by creating characters that you don’t want to release, Irving is doing exactly what you say you don’t need: “to plumb the deepest, darkest depths of my soul.” For a story to mean something to the reader, it must tap into some universal humanness. A good character will do this because he is believable and because we can relate to him, even if it’s just a small part. Irving writes the most fantastical settings, so foreign to my existence and yet the characters stay. Oh, and he also plots a mean storyline. Good entry–maybe I’ll pick up this new Irving book! That’s an interesting way to look at it. I suppose I meant that I don’t need an author to force me to contemplate the meaning of life, or human nature, etc. I don’t need a book to ponder the universe. I just finished this book and I have to admit I found myself skipping entire paragraphs here and there because I knew I wouldn’t miss much. While I liked the book I feel almost certain that Irving (or a good editor?) could have cut two hundred pages and made it a lot better.